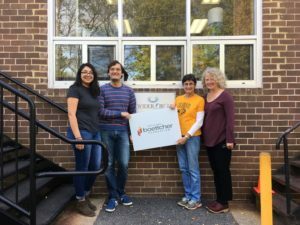 10 Nov Boettcher Scholars Participate in Coordinated Service Projects Across the U.S.
Boettcher Scholars throughout the United States participated in coordinated service events as part of the national Make a Difference Day effort on October 28. 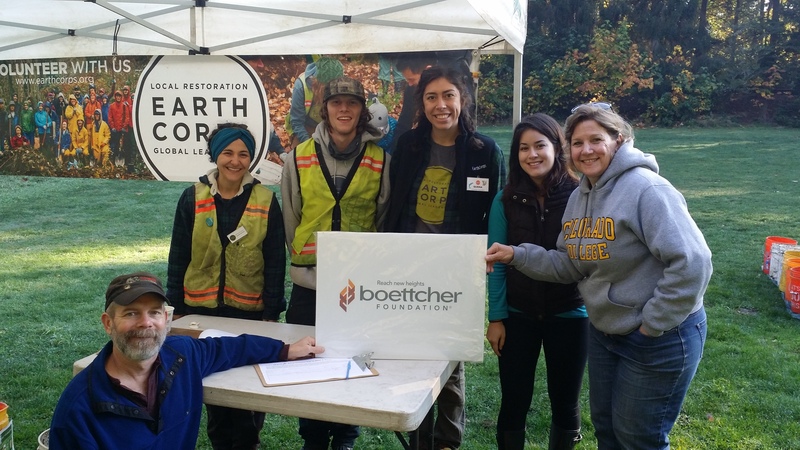 Boettcher Scholars in six communities organized and publicized the volunteer opportunity to their local Boettcher communities. We were thrilled to see the impact our scholars had in their regions and the joy they experienced as they reconnected. Below are reports from sites where scholars worked to make a difference. 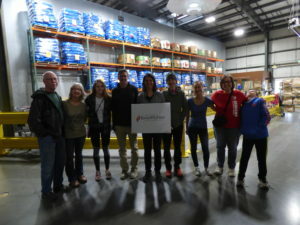 During the Make a Difference Day event in Colorado Springs, 16 wonderful volunteers (Boettcher Scholars, alumni, family and friends) helped to produce more than 500 senior food boxes for the Commodity Supplemental Food Program of Southern Colorado in conjunction with the Care and Share Food Bank of Southern Colorado. These food boxes will be distributed to low-income senior citizens through such organizations as Marian House, Salvation Army, High Plains Helping Hands, Eastern Plains Community Pantry, Silver Key Senior Services, Springs Rescue Mission, Connections 4 Life Center and more. Colorado Springs volunteers made a difference in the lives of more than 500 seniors! 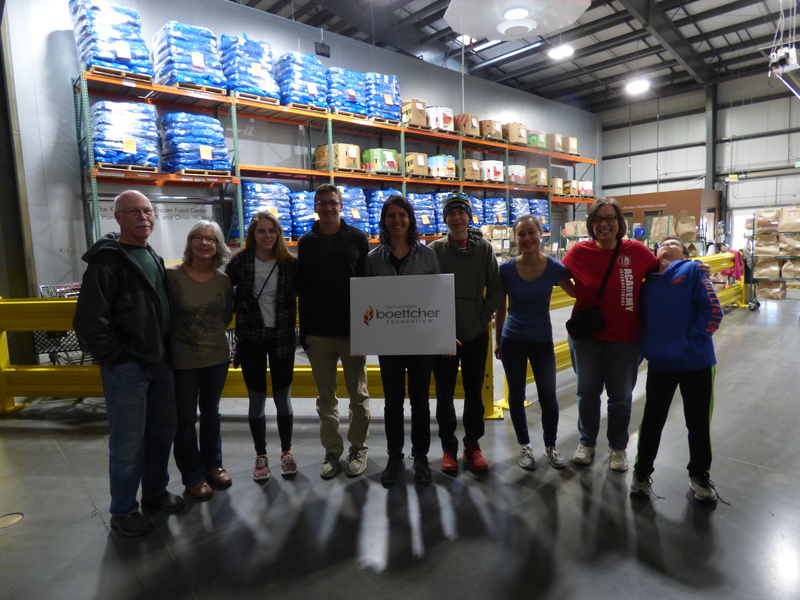 The Denver metro area Boettcher alumni scholars and their families had an amazing morning volunteering for Make a Difference Day! We worked at A Precious Child, a wonderful organization that assists children and families facing difficult challenges such as abuse and neglect, crisis situations, and poverty. A Precious Child helps these children and families navigate community resources and connects them with needed services, opportunities and educational support. 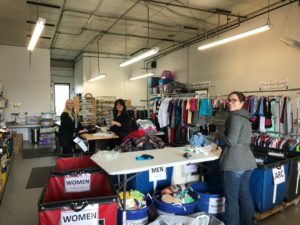 They also help them meet needs for basic items such as good-quality used clothing and infant-care necessities, through their Resource Center. This is where about two dozen Boettcher volunteers spent the morning, helping this wonderful organization “make a dent” in the piles and piles of donations awaiting distribution. It was a fun, successful and rewarding day! Annie the Railroad Dog spent her days greeting visitors who traveled through Fort Collins in the 1930s and 40s. Since then, residents have increasingly welcomed dogs into our hearts and our homes. This is precisely the goal All Aboard Animal Rescue supports, and Fort Collins/Golden Boettcher Scholars and alumni were able to spend the day raising awareness for the group’s foster events. Sporting Boettcher Make A Difference Day totes for our supplies, we created some healthy competition between the gals and guys scholars teams of who could place informational fliers in the most creatively impactful locations across town. A couple of us have gotten together for various social events after having met that weekend, and apparently about 30 pups found their forever homes each adoption event weekend after Boettcher volunteers jumped aboard! The San Francisco Bay Area Boettcher alumni scholars had a great time volunteering for Make a Difference Day! We worked with San Bruno Mountain Watch and spent the morning on the steep slopes of San Bruno Mountain, helping to weed out invasive plant species. We learned how to use a mattock gardening tool, enjoyed learning tons of naturalist lore from our hosts, and saw a lone coyote crossing the hillside. Five of us were there representing the Boettcher Foundation: Lee Granas, Meadow Didier, Zach Gonzales, Erin Arnsteen and her husband Jess (who drove 2.5 hours each way to join us)! Afterwards we had a great lunch together and brainstormed future Bay Area Boettcher Scholar activities that we hope to try out. It was a very fun and successful day! 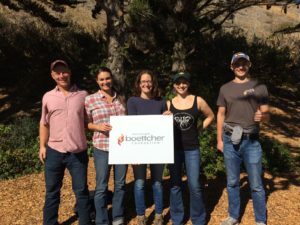 Seattle Boettcher alumni enjoyed planting trees, shrubs and other native Pacific Northwest plants under beautiful blue skies at Camp Long in West Seattle. 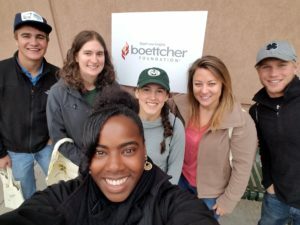 Two alumni, one Boettcher guest and other EarthCorps volunteers planted 200 saplings. EarthCorps staff encouraged us to name each plant and give it our blessing, which added a fun element to the day. McKenna Asakawa (2012) proudly named our last planting, a Douglas fir, “Claude” in honor and gratefulness for our Boettcher Scholarship founder. May Washington’s Claude grow tall and serve multiple generations well! 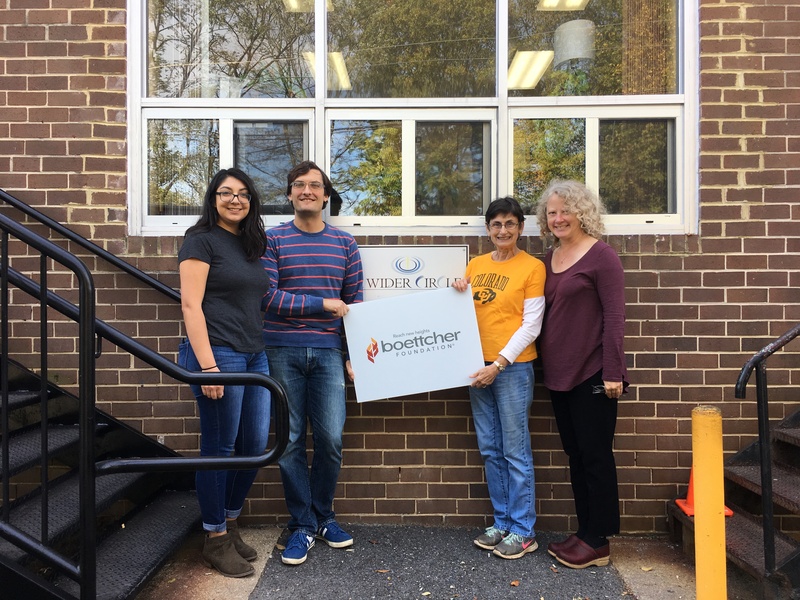 During the Make a Difference Day event in the Washington, D.C. area, Boettcher volunteers Bob Slevc (‘95), Scarlett Jimenez (‘13), Tracy Wahl (‘86) and Kitty Shaw Gardener (‘65) had a great time at A Wider Circle. A Wider Circle provides basic-need items to individuals and families transitioning out of homelessness, fleeing domestic abuse or otherwise living without the essentials of life. There were some “small-world” stories shared during the day – Kitty and Scarlett realized that they both went to Hinkley High School, nearly 50 years apart! And – Scarlett and Tracy live only a few blocks from each other in D.C. but had never met! The volunteers were all impressed with the organization and are primed to do more volunteer work. It was a great day!